On April 14 we celebrated our daughter’s first birthday. She is our answered prayers, the light our life, the never ending giggles in our house, our middle of the night escapades, our leg grabber, Daddy’s little helper, puppy tail grabber, and lover of all things food. We celebrated her birthday with friends and family and I think she loved having her house full of people who were giving her attention. She loved her birthday cake, and as you can tell by this picture was super excited to get her very own. Other than chasing all the other kids around I think this was one of her favorite parts of the day! When she was all done I simply dropped her in the sink and hosed her down. When we were putting her clothes on before everyone got here, at the last minute Daddy came out of her bedroom with the little pink strand of pearls he bought her for Christmas. The perfect touch! I will be honest I am not sure who loved opening presents more, her or all the other kids. Needless to say once everyone was gone I had to gather them all back up to get a good look at them so I would know which gift came from which person. But, it was just fine with me- I loved that everyone loved helping me with gifts…and I have a pretty decent memory when I set my mind to it. I was so happy to see that postcards came back! From near and far. 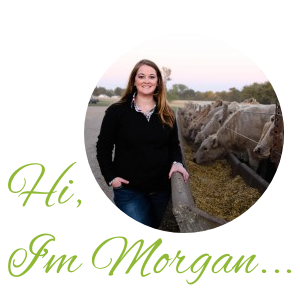 If you missed me blogging over at Real Farmwives of America, check it out to see exactly what I am talking about. I think this is something I will enjoy doing over the years and it will be fun to look back and see what special postcards everyone picked out for her. 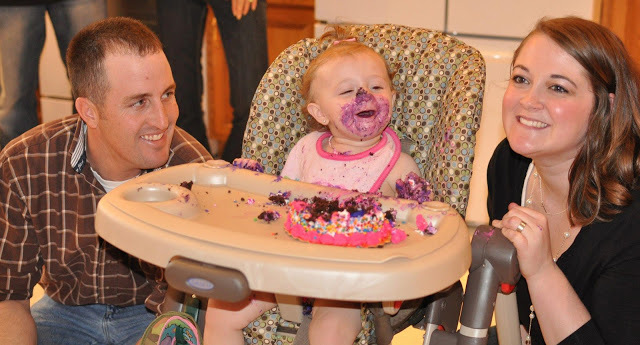 It is bittersweet to see my little girl turning one…the last year has been momentous to say the least. There were times I wondered if I would ever get past the medical issues and be able to enjoy being a Mommy. I am happy to be healthy and I enjoy spending every day with Elliette, whether it’s chasing her around and listening to her giggle, tantrums at nap times, checking cows, or having Mommy-Daughter days together. All in all she is a pretty good little girl. She is already developing her personality and every tractor noise she hears outside is “DaDa”. Everyday when we pull in to the shop yard in the ranger she immediately starts saying “DaDaDaDa”…I think the girl loves her Daddy and associates everything farm with him. She only really says MaMa or MOM when she really, really wants me. To possibly pick her up or she wants something I have. She is truly her Daddy’s girl-except at bedtime…then she is all about me. She started walking at 11 months and insists on walking everywhere these days. When we had a few breaks in the weather I simply spent the morning walking around the yard with her letting her explore everything. She loves walks with me, going for rides in the tractor, and her puppies and kitties. Drawing this last year to a close one thing I am really going to miss is filling out this. A calendar book for your little one’s first year. I have also been filling out a baby book, but my sister in law suggested this when I was pregnant and I loved it. It sat on our desk in the kitchen all year and I filled it out when we had visitors or did special things as a family. This is the last month. And I am a little sad. All it needs now is her birthday picture and the year is complete. Who knows maybe she won’t think these things are too special when she is older…but I love doing them for her and I hope she appreciates the memories. To end our birthday celebrations I did this little card for all the gift givers and postcard senders. I wrote Thank You on the card and a short little personalized message. All year I have been doing Ellie’s little footprints for all the major holidays for grandparents, godparents, and us. This wraps up a full year of those little foot prints. 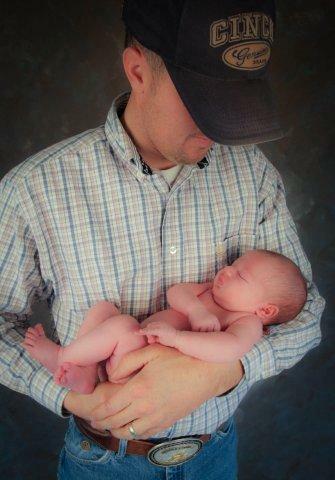 It is really neat to look back and see how big her little foot has gotten. I have always said that time moves fast anyway, this last year hasn’t been any different. I miss the middle of the night snuggles. I miss sitting on the couch and just looking at her. I miss simply carrying her carseat where ever we go. I miss fighting over who gets to hold her with Jason. But, I am so looking forward to our first beach vacation, more Mommy Daughter days, tractor rides without the carseat, chasing her around the yard, her first time in a swing, cuddling up to have popcorn and watch a movie, and most importantly watching her grow into a young woman. We love you Ella Bella and can’t wait for the next year of your life! I have one of those 1st year calendars and love it. 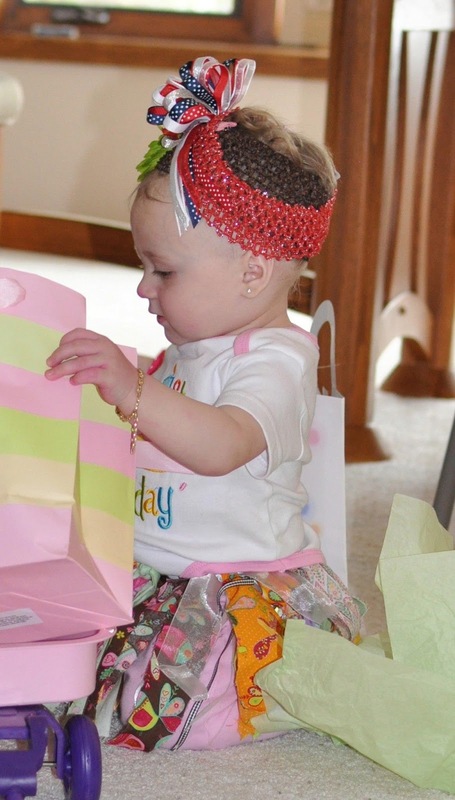 her little birthday outfit was adorable!!!! !